Rausch Angels — “rausch” is the sound the wind makes in their wings. We’d chosen our little pre-holiday jaunt out of the many fabulous places featured in the Rick Steves’ European Christmas book/episode (I’m a big Rick fan.) 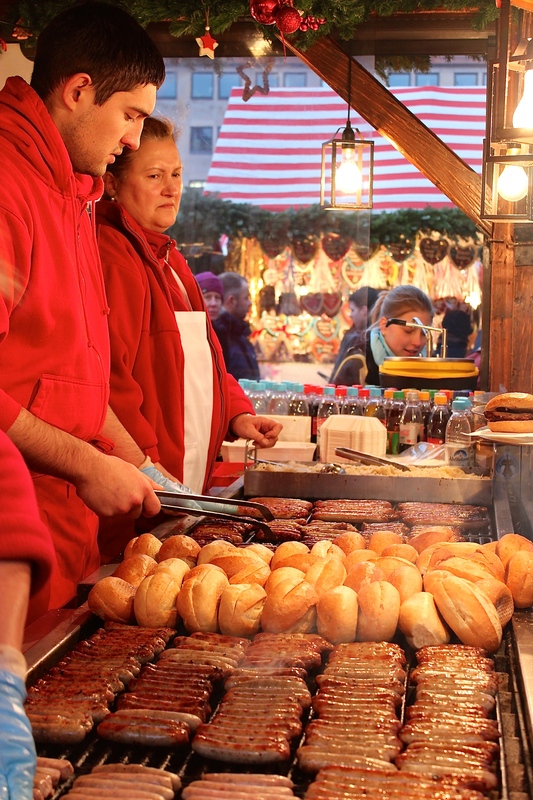 I’ve watch his DVD every year and dreamed of experiencing my own Christmas in Europe, so we decided that our first stop on the agenda would be Nürnberg (Nuremburg), which has one of the largest, oldest, and most famous Christmas markets. Upon our arrival, we headed right out into the pouring rain to consume our first of what would become legions of the famous, tiny Nürnberg bratwurst — as Rick puts it “as skinny as St. Nick’s little finger.” Spicy, smokey, and doubly delicious with sauerkraut and brown mustard, these small sammies sustained us for practically every meal. Add to that the mountain of potato pancakes we wolfed down, and I think we pretty much ate our weight in carbs and proteins from just these two foods. That night at the bratwurst stall, we offered the shelter of our umbrella to a very young German couple who spoke English. In the course of the conversation, Matthew shared that his mother is German, with various family members and friends having immigrated to the U.S. in the latter half of the 19th Century. “Why would anyone ever want to leave Germany?” the girl pondered. “Poverty,” Matthew replied. “No jobs to be had, so Chicago as an industrial town became a harbor for a huge wave of German immigration.” She looked at us blankly, as if she couldn’t possibly fathom her country being anything but the economic powerhouse it is today. Interesting how populations and perceptions ebb and flow over time. “Plum Men,” with bodies of figs, heads of walnuts, and limbs of prunes. The next day, the rain abated and we headed out to canvass the market. And I do mean canvass. I was intent on finding three traditional Bavarian decorations that I’d long admired but wanted to purchase in their homeland rather than in some random Chicago gift shop. 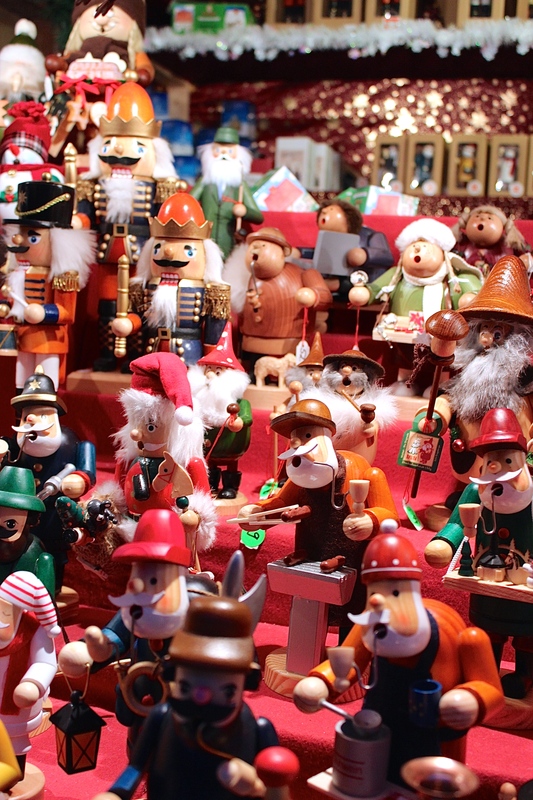 These included: a räuchermann (a carved, wooden “smoking man” for burning incense), a Weihnachtspyramide (a “Christmas pyramid” animated via a propeller spun by the hot air rising from burning candles), and the Nürnberg special — the Zwetschgenmännla (“plum men”). According to legend, an old man on his deathbed was cured by the singing of children. To thank them, he made little dolls from dried fruit, which became such a hit that folks still sell them in the market today. Smokers and nutcrackers of every occupation. Finding these treasures wasn’t a problem. But deciding which to buy from the dozens of stalls offering them was like choosing kittens at the pet store. Poor Matthew, for three days I drove him nuts circling the market while debating the merits of my favorites. Embarrassingly, I finalized my choice only about ten minutes before we headed to the airport. But this gives you some idea of just how vast and varied the fair is. Looking for a nutcracker who practices dentistry? Check. Need a fragile glass ornament shaped like a beer mug? Got ’em. Wanna crèche set made up of carnival animals? No problem. 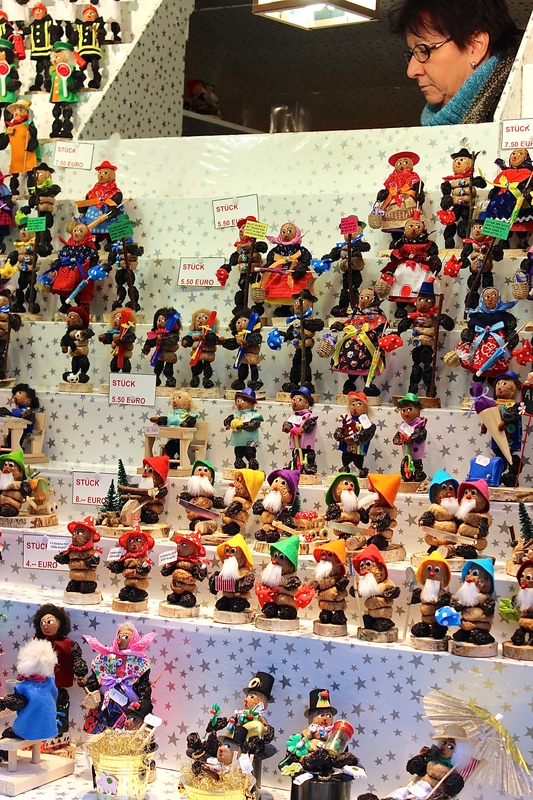 And woven throughout the stalls featuring amazing feats of woodworking and glassblowing were vendors selling traditional wheat tree-toppers, hand-embroidered linens, tinsel “rausch” angels (the emblem of the fair), chocolate-dipped fruit, marzipan, and lebkuchen by the ton. 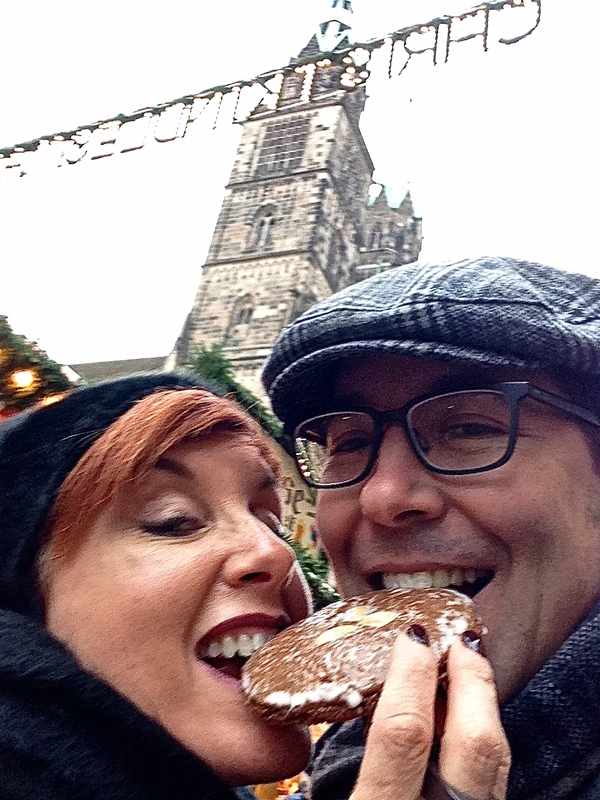 A word about lebkuchen. I’ve had the dry, sea-biscuity stuff you can get in U.S. grocery stores, but the Nürnberg versions are delicious. Soft, warm, and moist, you’ll find the gingerbread in a loaf, a cake, or pressed, painted, and all dolled up in cookies of every shape and size. Dip your choice in a little ceramic mug of glühwein (spiced wine) and you’ll never dunk another donut in coffee. But more about this tomorrow….